“Casablanca, Sahara, Berber, Marrakesh: simply uttering the words spawn romantic images and notions of nomadic times. Camels driven by blue djellaba-clad men, date palms swaying in a never-ending hot breeze with the unrelenting power of the sun overhead. Caravans crawling off the sand toward walled destinations buzzing with energy within their ancient medinas. The narrow stall-lined streets ushering the weary traveller to a body reviving hammam or perhaps a soul redeeming mosque, as the call to prayer reverberates through the air. As a student in world geography and politics, Morocco has been a country that I have craved to explore. In October 2016, the opportunity presented itself to fulfil this desire. With camera and backpack in tow, I boarded a plane and started my three-week odyssey into this ancient Islamic nation. Due to the geography of this constitutional monarchy, there is a well tramped classic “tourist” route followed by many travellers. My itinerary commenced along the Atlantic coastline, veering into the breadbasket of the country, then south to the undulating sand dunes of the Sahara, east over the highest mountains in North Africa and finally settling in Marrakesh. Transportation options were as diverse as the countryside: ranging from camels, horse-drawn carriages, small vans, trains, taxis and public buses. The camera worked overtime capturing the lands change from the Atlantic’s salt filled air to the Sahara’s raw exfoliating sand. Along the way, I was educated by local guides on some of the finer points of water conservation, camel husbandry, and date harvesting. In summary, my journey encompassed the exceptional diversity of cultures that have mixed through the ages on the NW tip of Africa. From the original Berber tribes to the invasion of Arabs, the Jewish and Moors fleeing the Spanish Inquisition, and the establishment of the Spanish and French protectorates – Morocco has a blended history that leads to mixed cuisine, remarkable architecture, and most of all people. “The Marauders of Morocco” will capture my exploration of the country and share not only the scenes I captured with my camera but also the story behind them. Homage will be paid to the Berber tribes, that throughout all of the crusades and invasions, stood tall and strong over the years and still play such an integral part in modern day Morocco”. 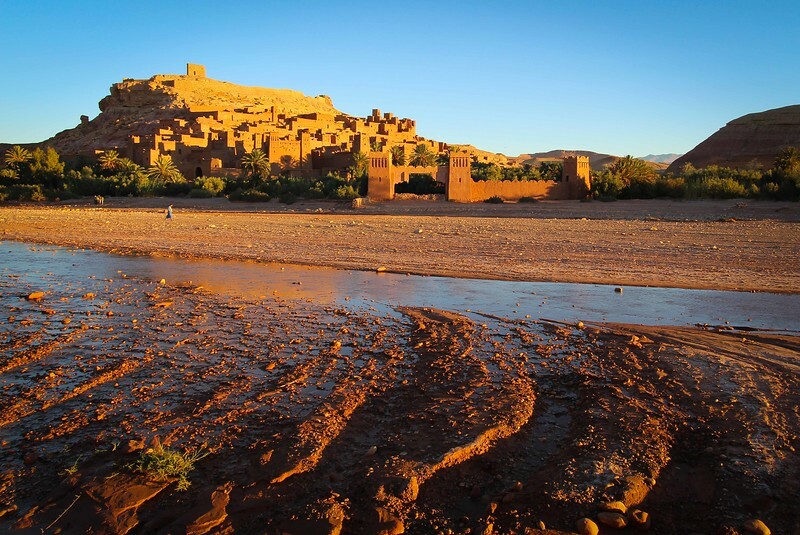 From Laurence of Arabia to Gladiator, to the recent Game of Thrones – many movies have found a backdrop setting using the Kasbah at Ait Benhaddou. An early morning sunrise highlights the beautiful walls and meandering Dades River. Although mostly deserted from actual inhabitants, the Kasbah serves as a tourist mecca along the journey over the Tichka Pass en route from Marrakesh to the Sahara.